Well the weekend is over. Hope all of you enjoyed yourself…….ate, drank, and caught some firework displays. We had a few reports from the last few days. 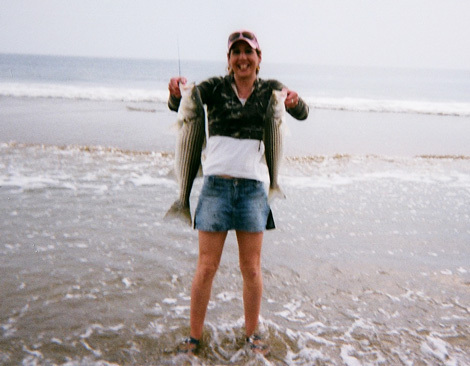 Seems the stripers ran the oceanfront off and on. And funny enough, more of the action seemed to be on the low tide side of things. Bait of choice on the oceanfront seemed to be clams and worms. Steve from Lynn just phoned in with a report. 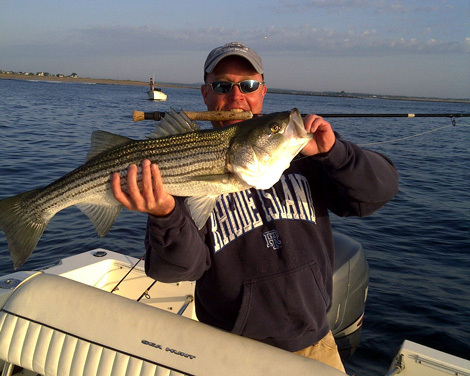 Steve went out on the 1/2 day trip with the Captains Fishing Party Boats, located at the end of the island. He did the mackerel trip and wasn’t dissappointed. They hit lots of mackerel (tinkers) about 3 miles off of the Hampton area. We seem to have a lot of tinkers this year. Wonder where the big mackerel are??? 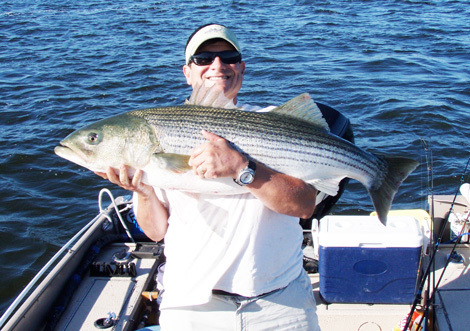 If you are visiting the area for vacation, need something to do with the kids, or just need a fun day out, the Captain’s do some 1/2 day trips for mackerel, bass, and flounder. Check them out at www.captainsfishing.com. They are another family run business that has been on Plum Isalnd for a few generations. Our 4th of July Raffle winner was picked last night. Emily from Rochester, NY is visiting the area. Her grandfather used to rent on the island and she has many fond memories of Plum Island. Well she was in picking up a new sticker so I had her draw the winner. The winner of the raffle is Matt Weeks. Called Matt last night just after closing and he said “sweet”, so i think he was happy about winning. We raised $118.00 dollars from the weekend raffle, that’s another rehab session paid for at Journey Forward for Nate. Thanks again to everyone that takes a chance on our raflles to benefit Nate. We have also started another raffle that will go through Labor Day. There are lots of prizes for this one! Will post more details soon! Stickman was out on the Parker yesterday, here’s what he had to say, “Yesterday I was on the backside as of the island, and went out the Parker Mouth about halfway down Cranes Beach. I saw a bunch of gulls working, and you know how lazy they are. It was just after the top of the tide so I idled up and sure enough, there was a small batch of breaking fish. The seemed to be hitting peanut bunker on the surface, as the minnows were spraying out of the water in big V shaped masses. Some of the fish on them were big, I mistook the first ones as small tuna. I think it was a mix of bass and blues. I threw a big yellow plug in the mix but had no chasers. Should have used a small plastic. I saw one boat grab a couple small blues with an umbrella rig. There was also a huge bunch of bait up in the Plum Island River when I came over from the Merrimack. Sometime that’s gonna drop out either the Mack or the Parker and we’ll all have a great time. We got this interesting note from Don LaRuffa of Salem, NH today, “Hey there, I wanted to share this photo with you of one of the nicest bass I’ve ever landed. Got her last week and sent her back on her way after a few quick photos. That is an interesting fish. I got this quick snap from our friend U-Boat this morning. No details, but looks like he’s using his fly rod for schoolies. It’s a great read for our world. Got this pic last week from Jessica H. who says, “Caught these ocean side across from your shop last week. One on the back hook and one on the front,using a big top water plug. See you this weekend.” It’s great to see the small fish on the beach front too! Thanks Jessica. Last week I also got a few snaps from this gang: George (beanie hat) matt (shirtless) Annie (the girl) James (gray shirt) all of us from Manchester NH. All caught on chunked Mak just before high tide. End of June. Nice Wheels Too! Never saw the sand eels as thick as they were this last weekend!! Bass all weekend long feeding on them at all tides. The bass were a bit finicky, but if you were able to drift a live bait into the school, you would be rewarded with fish from 29-35″. I will never stop being amazed at how many boats would drive right into the schools of busting fish and scare them away!! Nice shots, great report. We enjoy the reports and pictures ! Thank you!